One of the most familiar insects in the world is the Honeybee. This member of the insect order Hymenoptera plays a key role in the human and natural world. More has been written about honeybees than any other species of insect. The human fascination with this insect began thousands of years ago when people discovered what wonderfully tasty stuff honey is! Honey is a thick liquid produced by certain types of bees from the nectar of flowers. While many species of insects consume nectar, honeybees refine and concentrate nectar to make honey. Indeed, they make lots of honey so they will have plenty of food for times when flower nectar is unavailable, such as winter. Unlike most insects, honeybees remain active through the winter, consuming and metabolizing honey in order to keep from freezing to death. Early humans probably watched bears and other mammals raid bee hives for honey and then tried it themselves. Once people found out what honey was, next they had to learn how to get it from the bees safely! Honeybees have a bright color pattern to warn potential predators (or honey thieves!) that they have a weapon to defend themselves. Their weapon is a modified ovipositor (egg-laying tube). This is combined with a venom gland to create a stinger (formally known as an aculeus) located at the end of the abdomen. Because the stinger is modified from a structure found only in females, male bees cannot sting. When the hive is threatened, honeybees will swarm out and attack with their stingers to drive the enemy away. Honeybees, like most insects, look at the world through compound eyes. These are made of hundreds of small simple eyes called ommatidia. The images received by all the ommatidia are put together in the insect's brain to give it a very different way of seeing the world. To see the world the way a bee does, check out Andrew Giger's B-Eye web site in the links section. Honeybees are social insects. In the wild, they create elaborate nests called hives containing up to 20,000 individuals during the summer months. (Domestic hives may have over 80,000 bees.) They work together in a highly structured social order. Each bee belongs to one of three specialized groups called castes. The different castes are: queens, drones, and workers. There is only one queen in a hive and her main purpose in life is to make more bees. She can lay over 1,500 eggs per day and will usually live less than two years, although there are a few records of queens living longer than that. She is larger (up to 20mm) and has a longer abdomen than the workers or drones. She has chewing mouthparts. Her stinger is curved with no barbs on it and she can use it many times. Drones, since they are males, have no stinger. They live about eight weeks. Only a few hundred - at most - are ever present in the hive. Their sole function is to mate with a new queen, if one is produced in a given year. A drone's eyes are noticeably bigger than those of the other castes. This helps them to spot the queens when they are on their nuptial flight. Any drones left at the end of the season are considered non-essential and will be driven out of the hive to die. Worker bees do all the different tasks needed to maintain and operate the hive. They make up the vast majority of the hive's occupants and they are all sterile females. When young, they are called house bees and work in the hive doing comb construction, brood rearing, tending the queen and drones, cleaning, temperature regulation and defending the hive. Older workers are called field bees. They forage outside the hive to gather nectar, pollen, water and certain sticky plant resins used in hive construction. Workers born early in the season will live about 6 weeks while those born in the fall will live until the following spring. Workers are about 12 mm long and highly specialized for what they do, with a structure called a pollen basket (or corbiculum) on each hind leg, an extra stomach for storing and transporting nectar or honey and four pairs of special glands that secrete beeswax on the underside of their abdomen. They have a straight, barbed stinger which can only be used once. It rips out of their abdomen after use, which kills the bee. The central feature of the bee hive is the honeycomb. This marvel of insect engineering consists of flat vertical panels of six-sided cells made of beeswax. Beeswax is produced from glands on the underside of the abdomens of worker bees when they are between 12 and 15 days old. House bees take the beeswax and form it with their mouths into the honeycomb. 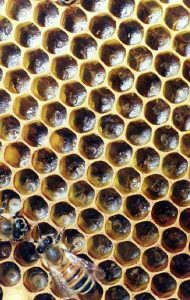 The cells within the comb are used to raise young and to store honey and pollen. The comb is two-sided, with cells on both sides. As you can see, the cells are perfectly uniform in shape. Not only that, but the combs are built a precise distance apart depending on whether they are meant to contain food or young bees. The nursery area of the hive is called the brood comb, and that is where the queen lays her eggs. Flower nectar is one of two food sources used by honeybees. The other is pollen. Both are gathered by the field bees as they fly about on their daily foraging flights. As the field bees forage for nectar, pollen sticks to the fuzzy hairs which cover their bodies. Some of this pollen rubs off on the next flower they visit, fertilizing the flower and resulting in better fruit production. Some plants will not produce fruit at all without the help of honeybees. In the United States alone, it is estimated that honeybees accomplish 1/4 of the pollination needed for all fruit produced for human consumption - an estimated $10 billion worth of work each year! The field bees stop periodically to groom themselves and collect the pollen onto their pollen baskets. They remove this load from their legs when they return to the hive and the house bees store it in a special part of the comb. The pollen provides protein and other essential nutrients for the bees. Cave paintings in Europe indicate that early peoples were harvesting honey 8,000 years ago. The next step in human/honeybee relations came when people started keeping bees in man-made structures rather than just going out and searching for wild hives. The ancient Egyptians were beekeepers and their methods were copied throughout the Mediterranean and Middle East. They used the Western Honeybee, and that is the most widely used species today. The Eastern Honeybee was also domesticated long ago in China. The other two species of honeybee do not nest in cavities and so were not suited to being put into hives. The subject of beekeeping is beyond the scope of this web page. For more information, see the links below. More properly called Africanized Honeybees, these come from a subspecies of honeybee (Apis mellifera scutellata) released accidentally in Brazil in 1957. They were imported from South Africa by a researcher who was attempting to produce a variety of honeybee better adapted to the tropics than the European Honeybee. Unfortunately, Africanized Honeybees not only produce honey better in hot climates, but they are also much more aggressive at defending the nest. Many people have been killed by mass stinging resulting from getting too close to a nest of Africanized honeybees. The escaped bees did well in the wild and began reproducing and expanding their range across South America into Central America and Mexico. They were recorded in Texas in October 1990, California in November 1994 and Oklahoma in 2004. Since they are adapted for tropical conditions, they may not expand their range beyond the southern part of the U.S., but that remains to be seen. They can tolerate up to 3 1/2 months of freezing weather. Graphic from the Carl Hayden Bee Research Center. Visit their web site to learn more about Africanized Bees! Colony collapse disorder (or CCD for short) refers to a mysterious malady affecting domestic honeybees that causes them to leave the hive and not return, leading ultimately to death of the colony. First noticed in late 2006 in North America, CCD has been the focus of much research to try to determine what is causing it. Pathogens, parasites, environmental toxins and even cell phone transmissions have been the subject of investigation. As of this writing (November 2007) the one factor that has been identified as being uniquely associated with CCD is a virus known as Israeli Acute Paralysis Virus (IAPV). It is not proven yet that IAPV is the sole cause of CCD, but it is found in nearly all hives affected by CCD. A possible scenario is that CCD is triggered by various stress factors in bees infected with IAPV. Research is currently underway to test this hypothesis. For more information on CCD, see the Mid-Atlantic Apiculture Research and Extension Consortium website. There are over 25,000 kinds of bees in the world. About 3,500 different species are known from North America alone! Some of the more noticeable types are listed below. (and sometimes red) bands of hairs. The long mouthparts of bumblebees allow them to gather nectar from flowers that have their nectaries buried deep within the petals, such as red clover. They are social nesters, although their society is not as highly ordered as that of honeybees. In contrast to honeybees, nests are made anew each spring by solitary queens who hibernate through the winter. The large bumblebees seen in the spring are queens looking for food and a place to start a new colony. They will often take over an abandoned field mouse nest for their own. Laura Smith's bumblebee.org has a lot of information about bumblebees. 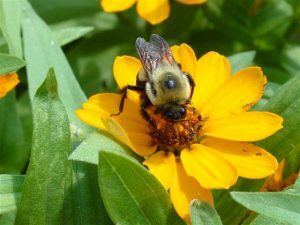 Another good site for bumblebee information is maintained by The Xerces Society. Carpenter bees resemble Bumblebees, but they may be recognized by their dark, shiny (hairless) abdomen. The common North American species east of the Rocky Mountains is Xylocopa virginica. They are solitary nesters and make their nest by chewing tunnels into wood. Often people will notice them burrowing into the rafters of barns or outbuildings. On a quiet day you can hear the bee at work as she chews her way into the wood with her strong mandibles. The hole is 1/2 inch in diameter and goes straight in about 2 inches before branching at right angles into the brood chambers. The males are sometimes encountered patrolling near a nest in a distinctive bobbing flight. This can lead to some anxious moments if you are suddenly confronted with a large hovering bee only a few feet in front of you! The bee is looking for a mate, however, not a fight, and since it is a male it cannot sting you anyway! Male carpenter bees have a white face. Learn more about Carpenter Bees from University of Kentucky Entomology. This family of small, often metallic-colored bees has about 500 species in North America. They are primarily solitary nesters, but some show a degree of social behavior. Only a few species in the genus Lasioglossum are attracted to sweat. They are just after water and do not want to sting, but they will if you purposely or accidentally squeeze them. Their food consists of the normal bee diet of pollen and nectar. They typically dig a vertical burrow in the ground with side chambers for the eggs. Leaf-cutter bees (Megachile sp.) are a type of bee which has the interesting trait of chewing little circles out of leaves or flower petals and using these to construct small, thimble-shaped nests in a dry, protected location. They are typically dark in color with bands of whitish hairs running across the abdomen and range in size from 5 - 25 mm. There are 130 species in North America. Both leafcutters and mason bees (see below) are superior pollinators compared to honeybees. One leafcutter bee will do the same amount of pollination as 20 honeybees! To learn more, read what the USDA Agricultural Research Service has to say about the Alfalfa Leafcutter Bee. Mason bees (Osmia sp.) typically use the abandoned tunnels of wood-boring beetles for their nest. These small bees are not social. Mason bees mate immediately after hatching in the spring. The female then searches for an appropriate hole or crevice to build her nest. After preparing a brood chamber, she gathers pollen and nectar until she has enough to feed a larva to adulthood. Then she lays an egg and closes the chamber with mud. She repeats the process until the tunnel is completely filled and caps the tunnel with an extra-thick plug of mud. She will repeat this process until she dies in early summer. The mature larvae pupate and overwinter in their nursery cells. Mason bees are closely related to the Leaf-cutting bees. To gather pollen, they both use a brush of hairs on the underside of the abdomen (called a scopa) instead of pollen baskets on their legs. There are 140 species in North America. You can find out more about Mason Bees from the North Carolina Extension service and the Wikipedia entry for the species. Texas A&M University also has a lot of honeybee information. The National Center for Appropriate Technology has a detailed reference on native North American bees available for purchase at the NCAT web site.